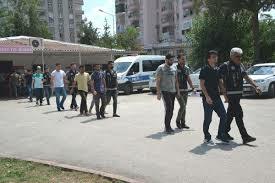 Turkish police on Saturday detained 25 university students in Adana province as part of an investigation by the Adana Chief Public Prosecutor’s Office into the Gülen movement, the state-run Anadolu news agency reported. According to the report, police raided student housing in Adana city center. Media reported later in the day that 13 of the suspects were released. Turkish President Recep Tayyip Erdoğan and his ruling Justice and Development Party (AK Party) government pursued a crackdown on the Gülen movement following corruption operations in December 2013 in which the inner circle of the government and then-Prime Minister Erdoğan were implicated. Erdoğan also accuses the Gülen movement of masterminding the failed coup in 2016. Interior Minister Süleyman Soylu on Dec. 12, 2017 that 234,419 passports had been revoked as part of investigations into the movement since the failed coup. This article originally appeared in Turkish Minute on June 2.